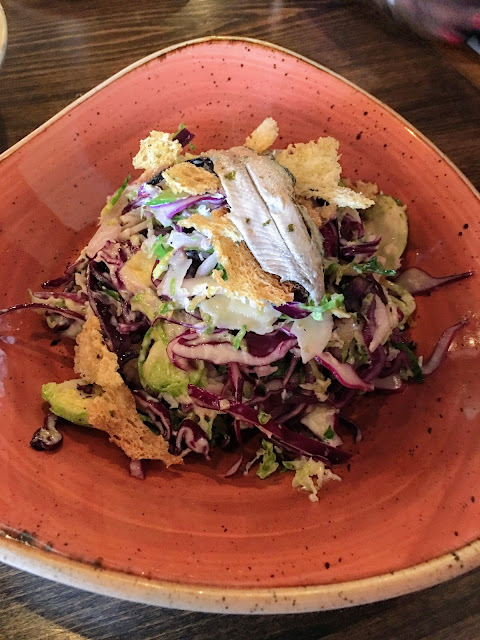 DAY TRIP TO RED BANK: I loved this Caesar-style Warm Cabbage Salad ($12), topped with an unsalted anchovy, at B2 Bistro + Bar in Red Bank, a garden-to-table restaurant where we had lunch last Sunday before seeing a play, August Wilson's "King Hedley II." NEW JERSEY OYSTERS: I started lunch with a trio of these wonderful Elder Point Oysters from Delaware Bay ($2.75 each). Another great New Jersey oyster is the Cape May Salt, which I've enjoyed at the 100 Steps Supper Club + Raw Bar in Cranford. HACKENSACK, N.J. -- It's always great to get out of Hackensack, where I live, and try to forget my high property taxes and the city's crumbling streets. But you can substitute the name of almost any other town or city in New Jersey, where hundreds of local home-rule governments, no matter how small, insist on having their own police chief, superintendent of schools and on and on, running up the tax bill. Now, I don't know anything about how well or poorly Red Bank is run, but a day trip to that bustling shore city can almost make you forget all of the damage to mass transit, the environment and state finances left by GOP bully Chris Christie after 8 years as governor of New Jersey. 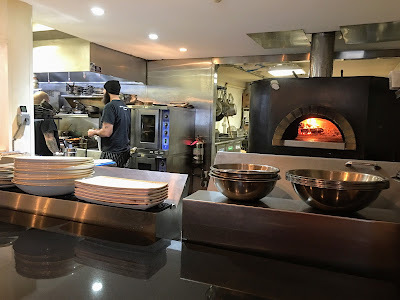 That was the case last Sunday, when we drove down for lunch at B2 Bistro + Bar and a play at Two River Theater, the latter an event sponsored by WBGO-FM, the great jazz station in Newark. 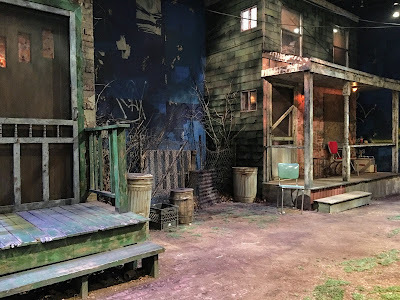 We saw another play, "A Raisin In The Sun," there in October 2017, also a trip for members of Jazz 88. 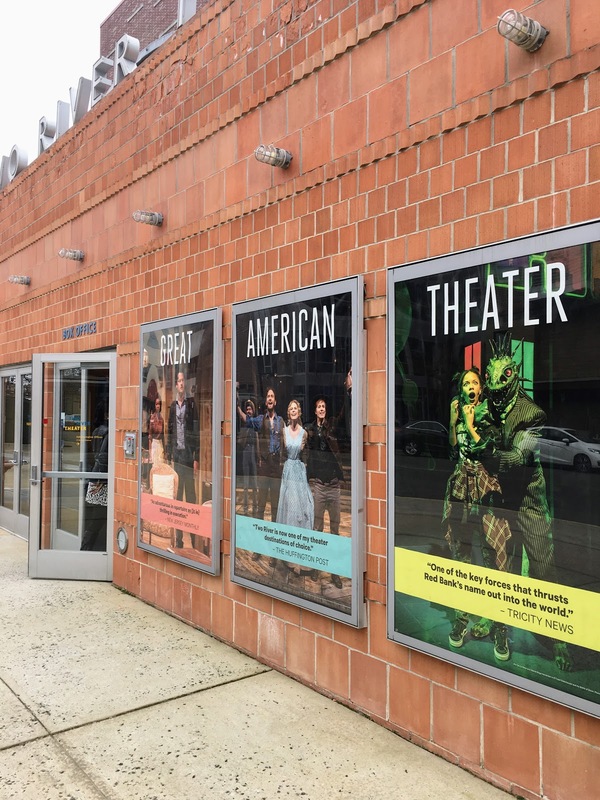 The theater is expanding, and there was no parking in its own lot, but just a couple of blocks away, parking was free in the lots of the NJ Transit rail station. What a concept. NJ Transit rail lots open and free on Sundays for visitors to Red Bank. Are the NJ Transit rail lots in Hackensack free on Sunday? B2 BISTRO + BAR: The open kitchen and pizza oven at B2 Bistro, which serves food from New Jersey farmers, fishermen and specialty purveyors. BUTTER SERVICE: I don't use butter, but my wife does. 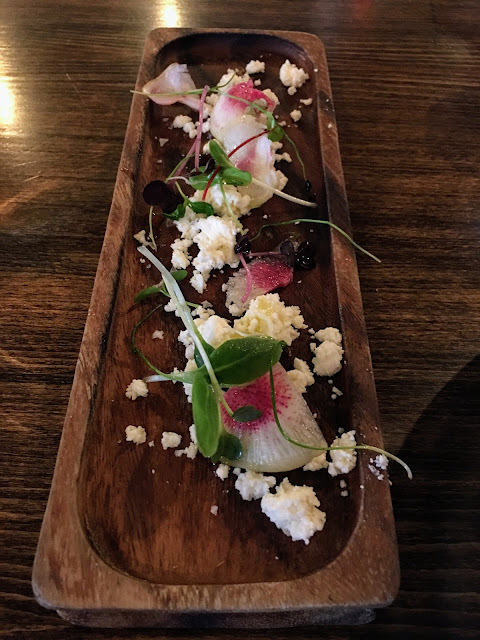 I was able to pluck a few microgreens off of the tray. SWEET AT THE ROOT: I also ordered a side of Glazed (Root) Vegetables ($7), but found them too sweet. 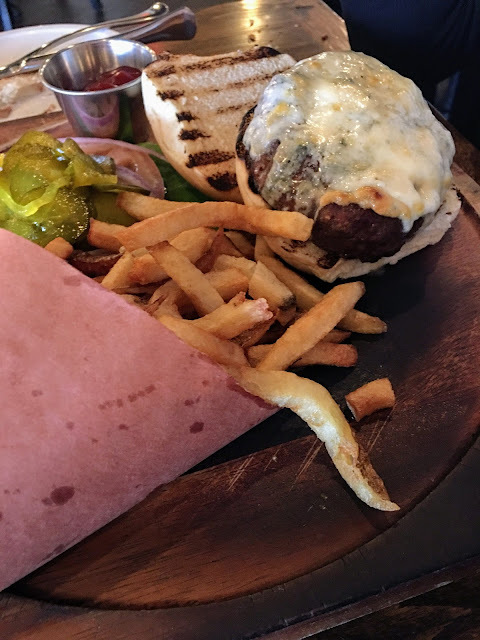 BLUE CHEESE BURGER: My wife enjoyed her thick Dry Aged Burger, served with a cone of french fries and a small salad. The burger was $19, including $3 for blue cheese. AMERICAN CENTURY CYCLE: Two River Theater, above and below, is half way through a presentation of August Wilson's American Century Cycle, 10 plays exploring African-American life for each decade of the 20th century. All of the plays but one ("Ma Rainey's Black Bottom") are set in Pittsburgh's Hill District, where Wilson was born and lived until 1973. KING HEDLEY: In August Wilson's "Seven Guitars," set in 1948, the character King Hedley I is "a Haitian man who lives by his own set of principles ... and searches for a woman to have a child with," according to the program. Another character, Ruby, "is traveling to Pittsburgh after a love triangle in Alabama leaves one of her lovers, Leroy, dead and another, Elmore, in prison. After she arrives, Ruby and Hedley form an unlikely relationship," the program explains. 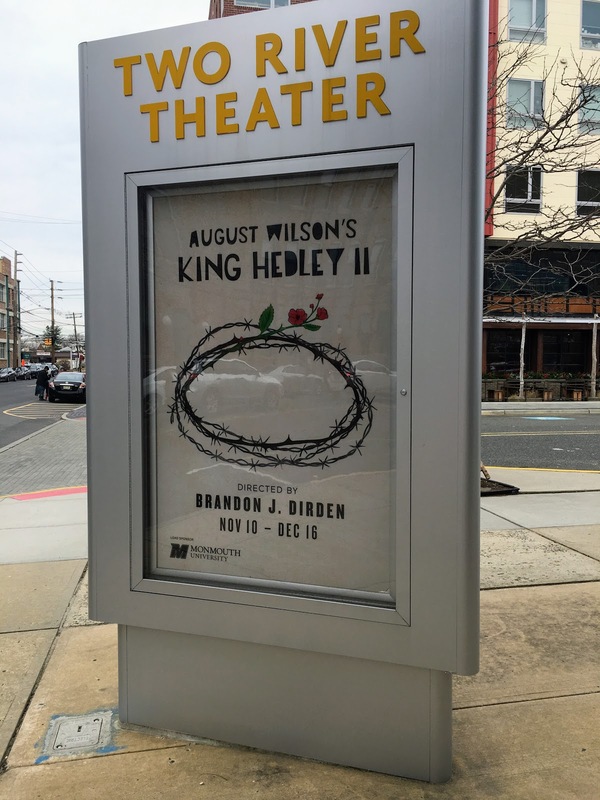 KING HEDLEY II: The play takes place 37 years later, in 1985. King Hedley I is dead. "After years on the road, Ruby returns to Pittsburgh ... to see her son, King Hedley II.... Elmore (one of Ruby's former lovers) sends a letter telling Ruby that he is coming to visit.... King works to establish his own legacy in the decaying Hill District [where nearly everyone is armed]. But like his namesake from 'Seven Guitars,' King Hedley II lives by his own set of principles," the program notes.